Resistance is futile! The irresistible Borg Queen has been captured as a 9-inch-scale PVC statue - the next entry in the Star Trek Femme Fatales line! With a detailed sculpt and exacting paint applications, this static vinyl figure features a removable head and upper torso, to simulate her on-screen maintenance routine. 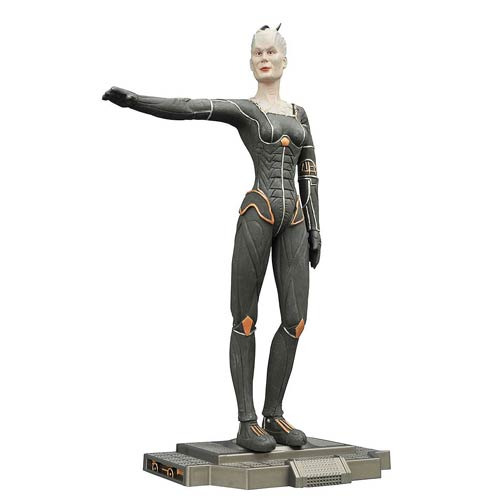 Displays alongside Seven of Nine, Counselor Troi, and all other Femme Fatales statues (sold separately)! Statue comes packaged in a full-color window box. Measures approximately 9-inches tall. Ages 14 and up.